OMEGATITE™650 is an alloy of silicon nitride and aluminum oxide. This superior refractory material has the combined properties of silicon nitride (high strength, hardness, fracture toughness, and low thermal expansion) and aluminum oxide (corrosion resistance, chemically inert, high temperature capabilities, and oxidation resistance). Most refractory products can be used only in high temperature applications where one or two of the following properties are required: thermal shock resistace, mechanical strength, corrosion resistance, abrasion resistance or electrical insulation. OMEGATITE™ 650 combines all these properties in one refractory material. OMEGATITE™ 650 is uniquely qualified for nonferrous molten metal applications and high wear or high impact environments up to 1250°C. OMEGATITE™ 650 is non-wetting for most nonferrous metals. It is gas tight, chemically inert, resistant to corrosion and metal attack, and features high strength, hardness, and thermal shock resistance. OMEGATITE™ 650 thermocouple sheaths are used extensively for continuous measurements in nonferrous metals. In molten aluminum, OMEGATITE™ 650 is thermal shock resistant, non-wetting, does not contaminate the melt, provides continuous, reliable temperature measurement, and is resistant to degradation even in aggressive aluminum lithium alloys. The excellent corrosion resistance of OMEGATITE™ 650 allows the use of thinner walls, thereby providing faster response time and improved accuracy. 참고: *For NPT fitting add -NPT suffix and $30 to price. A 1/2 x 1/2" NPT fits 12.5 mm O.D. 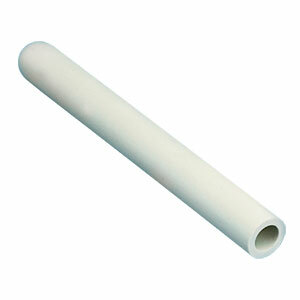 tube, 1/2 x 3/4” for 16 mm, 1 x 1” for 22 mm, 1 1/8 x 1 1/8” for 28 mm tube. For special lengths consult sales.